Golden Minerals is a $115 million market cap company with an average daily trading volume of 254,000 shares. The company was formerly known as Apex Silver and its headquarters is in Golden, Colorado. AUMN completed its merger with ECU Silver in September of this year. The Velardena district property in Mexico, is in the production ramp-up stage. It contains a M&I resource of 40 million AgEq ounces and has 391 million AgEq ounces inferred. The PEA for Velardena should be complete in Q2 of next year. Per AUMN as of March 2011, the total resource of nearly 500 million AgEq ounces (M&I plus inferred) leads all the junior producer peers. Additionally, it has the promising El Quevar project in Argentina, in the project evaluation stage as well as the advanced exploration Zacatecas project in Mexico. It has support from its largest shareholder- the powerful Sentient Group as well as Sprott Assets. The stock is down 75% from its 52-week high. 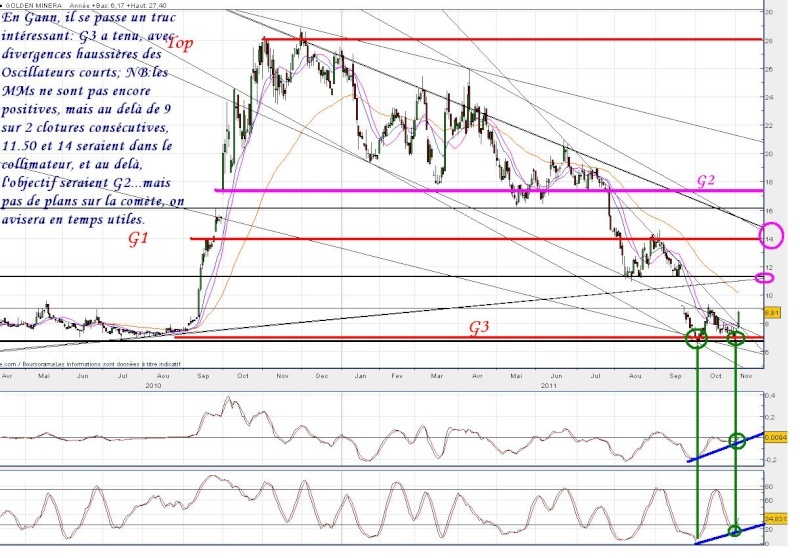 je note que Sprott est actionnaire, et ça c'est un très bon point ..
Sentient qui s'est goinfré sur ak perso .. connait pas , mais je vais me rencarder ..
GOLDEN, CO--(Marketwire -01/11/12)- Golden Minerals Company (AMEX: AUMN - News) (TSX: AUM.TO - News) ("Golden Minerals" or "the Company") is pleased to report significant operating improvements at the Velardeña Operations, located in the State of Durango, Mexico, since the merger with ECU Silver on September 2, 2011. The Company also announced plans to rationalize its extensive exploration portfolio. Payable metals production for September through year-end 2011 exceeded guidance previously provided in September by approximately 30% for gold and 114% for silver, primarily due to the increase in head grades resulting from reduced dilution. The following table shows actual production compared to the previous forecast for September through December 2011. Also shown is the updated 2012 forecast production for gold and silver. The 2012 Forecasted Production chart shows gold and silver production in silver equivalent ounces. Lead and zinc production are not included. Amounts shown are September through December 2011 actual gold and silver production compared to the previous forecast production, and forecast production for 2012. Since the merger with ECU Silver, Golden has made significant operating improvements at the Velardeña Operations. Golden's primary focus has been on improving head grade in the feed supplied to the mills and on moving underground mine development outside the mineral veins. The December average head grade for gold and silver in material supplied to the oxide mill has improved by approximately 70% over the August average head grade (from approximately 1.5 grams per tonne to 2.5 grams per tonne for gold and approximately 90 grams per tonne to 150 grams per tonne for silver). The December average head grade in material supplied to the sulfide mill has also improved significantly to approximately 2.0 grams per tonne gold, 174 grams per tonne silver, 1.7% lead and 2.0% zinc. The improvements are primarily related to moving underground development outside the vein, resulting in reduced dilution of plant feed. The Company has completed approximately 1,200 meters of mine development since early September and has commenced excavation on the San Mateo Ramp, the main production ramp that will access six major ore zones. Golden has also commenced plant optimization and other work to improve recoveries and product quality in both the oxide and sulfide plants. The Company plans to add a flotation circuit ahead of the current oxide plant to recover and divert to the sulfide plant more of the sulfide material that is currently mixed with the oxides. Based on these efforts, the Company expects the Velardeña Operations to be operationally cash flow positive in mid-year 2012 at current metals prices. Safety related improvements at the Velardeña Operations have included the installation of 15 face ventilation fans, establishment of three trained and equipped mine rescue teams and safety refresher training for all personnel. In addition, the Company has commenced engineering studies for a phased expansion of the sulfide plant by adding an additional ball mill, flotation cells and concentrate handling equipment. The phased expansion is expected to increase the sulfide plant's capacity from 320 to 650 tonnes per day which, along with operational improvements to the existing 500 tonne per day oxide plant, could result in annual production rates of up to 2 million ounces of silver and 29,000 ounces of gold by 2013. Expenditures for this phased expansion will be available later in the first quarter and are expected to be in the range of $10.0 million. The phased expansion would allow for an interim production increase pending completion of the proposed 2,000 tonne per day plant, which might occur as early as 2015. The 2,000 tonne per day sulfide plant could result in annual production of up to approximately 4 million ounces of silver and 80,000 ounces of gold. As was previously announced, the Company expects to complete an updated NI 43-101 compliant resource estimate for the Velardeña Operations towards the end of the first quarter 2012. The independent consulting firm of Chlumsky Armbrust and Meyer (CAM) has been retained to provide the updated resource estimate. The Company also expects to complete a Preliminary Economic Assessment (PEA) by the end of the third quarter 2012. The PEA will be based on the updated resource estimate and proposed expansion plans for the Velardeña Operations. Golden has commenced a process of rationalizing the Company's current exploration portfolio of approximately 80 projects in Mexico, Peru and Argentina. The Company expects the potential monetization of selected assets to generate value as well as significantly reduce greenfield exploration expenditures in 2012 and going forward. Jeffrey Clevenger, Golden Minerals Chairman, President and CEO, commented, "Management's primary focus is on growing production and establishing the company as an emerging producer." In addition, Mr. Clevenger noted, "This business strategy should allow Golden Minerals to more quickly become self-sufficient and less dependent on raising capital." An updated NI 43-101 compliant mineral resource estimate on El Quevar is being prepared by the independent consulting firm of Pincock, Allen and Holt (PAH). The updated resource estimate for the El Quevar project is now expected by the end of first quarter 2012. PAH has been asked to include an additional 23 drill holes for which assays have just been received. Golden Minerals is an emerging precious metals producer with a large silver and gold resource base in Mexico and a large silver resource base in Argentina. The Company, which is a Delaware corporation, is listed on both the NYSE Amex and TSX. Golden Minerals is primarily engaged in the ramp-up and expansion of existing production at the Velardeña Operations in Mexico and advancement of the El Quevar project in Argentina. The Company also has a large portfolio of exploration projects, including the advanced stage Zacatecas project in Mexico. This press release contains forward-looking statements within the meaning of Section 27A of the Securities Act and Section 21E of the Exchange Act, and applicable Canadian securities laws, including statements regarding forecasts of production from the Velardeña Operations and the effects on such forecasts of development work, mining and process improvements, operational changes, processing facility improvements, planned phased expansion of the existing sulfide plant and the planned construction of a new sulfide plant; anticipated improvements in feed head grades, metal recoveries, and concentrate production and quality; anticipated progress and rates of progress on the San Mateo ramp and its effectiveness in providing haulage access to undeveloped ore; planned construction of a new sulfide plant and the timing thereof; anticipated updates of resource estimates for the Velardeña properties and El Quevar and the timing thereof; anticipated achievement of cash flow positive operations at Velardeña by mid-year 2012; interpretation of the results of drilling programs and other geological information; planned rationalization of the Company's exploration portfolio for value and reduction of Greenfield exploration efforts and costs. These statements are subject to risks and uncertainties, including unexpected events at the Velardeña Operation, including lower than anticipated production or greater than anticipated costs; unexpected events at the El Quevar project or the exploration properties; variations in ore grade and relative amounts, grades and metallurgical characteristics of oxide and sulfide ores; delays or failure in receiving required board or government approvals or permits; technical, permitting, mining, metallurgical or processing issues; failure to achieve anticipated increases in production and improvements in head grades, recoveries and concentrate production and quality at the Velardeña Operation; delays in or failure to realize anticipated benefits of plant optimization efforts; timing and availability of external funding on acceptable terms to construct the planned sulfide plant, advance the development of El Quevar and other efforts; unfavorable interpretations of geologic information; inability to complete the phased expansion of the sulfide plant on time or at all or failure to realize anticipated production improvements from the phased expansion; unfavorable results of new resource estimates; loss of and inability to adequately replace skilled mining and management personnel; possible disputes with customers or joint venture partners; unanticipated difficulties or delays in completing the San Mateo ramp and failure of the ramp or the undeveloped ore accessed by the ramp to meet expectations; delays in the arrival of or loss of equipment being procured for the Velardeña operation; development of unfavorable information or conclusions regarding the economic or technical aspects of the planned sulfide plant for the Velardeña Operation, the amenability of the El Quevar deposit to bulk mining, or interpretations of geologic information; inability to generate value from the Company's exploration portfolio; failure to reduce greenfield exploration activities or costs; volatility or other changes in the U.S. and Canadian securities markets; availability and cost of materials, supplies and electrical power required for mining operations and exploration; fluctuations in silver, gold, zinc and lead prices, costs and general economic conditions; changes in political conditions, tax, environmental and other laws, diminution of physical safety of employees in Mexico, and other conditions in the countries in which the Company operates. Additional risks relating to Golden Minerals Company may be found in the periodic and current reports filed with the Securities Exchange Commission by Golden Minerals Company, including the Annual Report on Form 10-K for the year ended December 31, 2010. For additional information please visit http://www.goldenminerals.com. Veteran Café members know my sad, to euphoric, to horror show tale of my major precious metals investment, ECU Silver … now Golden Minerals. I went to Velardena, Mexico to view ECU’s major property in 1999 and became enthused about its prospects. The share price back then was 25 cents. I bought a bundle and the stock went to a ½ cent and was not allowed to trade for many months. Thinking the stock was a steal (don’t we all), I loaded the boat when the stock began to trade again. Over the years ahead the share price went to $3. From thereon in nothing went right (perception-wise) and its share price plummeted. It fell all the way back to 46 cents, rallied to a buck or so, and then was taken over by Golden Minerals on a 20 to 1 basis (1 GM share for 20 ECU shares). The logic of the merger made sense. ECU has a world class precious metals deposit in Mexico which was not being developed properly … partly because it was cash starved and was diluting itself into oblivion. Golden Minerals had plenty of cash and its management is known to be first rate, having the experience to develop what they already had in South America and now in Mexico. Great, right? Well the share price of GM then dropped to $5.23, which was close to a 75% drop in its value. What a nightmare! There are some out there who believe it was targeted by The Gold Cartel because of my GATA role. Others believe it was just part of a hedge fund shorting program. Whatever the reason, the shorts won the battle, burying the former ECU shareholders and the Golden Minerals shareholders in the process. However, it now appears, finally, the tide has turned. After making a high this morning of $8.69, GM closed today at $8.27, rising around 60% since making a very recent $5.23 low. Word to me is that at last glance there was a "known" short position of 2.5 million shares. The total short position is most likely FAR greater than 2.5 million. I said the shorts "won." They have so far, but ONLY if they cover their shorts soon and before the GM share price goes back to where it should have been all along. The question is, how do they do so without driving the share price sharply higher? We shall see. Anyways, I am in the Eric Sprott, John Embry camp in that I think the price of silver is going to go bonkers and that the share prices of quality silver producers will do the same. The old high of Golden Minerals was around $30. There is no reason not to believe its new share high price will not triple that old high in the years ahead (rising to $90 per share) as the prices of gold and silver SOAR. This is not investment advice but a roller coaster tale. The good news is there are a number of precious metals stocks out there in a similar boat. If you own one, now is the time to pay close attention, not throw in the towel … that is if they have the goods and the low share price makes no sense … not when we have a mania ahead of us in the gold/silver share sector. A press release titled, "Golden Minerals (AUMN) Reports Significant Operational Improvements at Velardena and Company Strategic Direction"
was issued January 11, 2012 and discusses enhancements that the company made to their gold and silver production in Q4 ’11. Additional improvements in mine development and ore recovery should allow Golden Minerals to expand production throughout 2012 and become operationally cash flow positive by mid-year 2012. Furthermore, AUMN plans to expand the size of the existing sulfide mill from 320 to 650 tpd. Along with "operational improvements to the existing 500 tpd oxide plant could result in annual production rates of up to 2 million ounces of silver and 29,000 ounces of gold by 2013." Ultimately, the company plans to construct an additional 2000 tpd sulfide mill which "could result in annual production of up to approximately 4 million ounces of silver and 80,000 ounces of gold" by 2015. At current metal prices, this would generate annual cash flow of $251 million—greater than the ridiculously low market cap that Golden Minerals had declined to at the end of 2011 amidst hedge fund shorting and tax-loss selling. Fortunately, just two weeks into 2012, AUMN has recovered 32% from the 2011 close. More gains are anticipated as the metal prices continue to recover and the market psychology for the sector continues to improve. Furthermore, John Hathaway, manager of the Tocqueville Gold Fund predicts that a "terrific short squeeze" will trigger a significant recovery for gold and silver mining stocks (attached). According to Hathaway, "We had extreme readings in terms of sentiment, measured any number of ways. Usually that means you are into the dry heave stage where there is nobody left to sell." Wistar is very sharp as is John Hathaway, whom I have not seen since he came to Dallas about a decade ago. However, his top aide, Doug Groh, came to Gold Rush 21 at our conference in the Yukon in August of 2005. Knock On Wood here, but I am hoping what Golden Minerals has done so far is just the beginning of the "terrific short squeeze." J'avais en effet, dans mon alerte graphique, chopé le point bas, à quelques centimes près, avant ce rebond de 60%... mais je dois à l'honnêteté de reconnaître que c'était aussi un coup de bol, dans la mesure où mon support a été brièvement enfoncé. Speaking of Golden Minerals, which is still my largest share position, there is no longer any doubt in my mind there are malign forces out there bent on keeping this share price going from where it ought to. This is probably the case in many of the gold/silver shares, which is why they have acted so poorly for so long. What happened today blew me away and convinced me what the extent of this short selling of the precious metals shares really is. Let me explain. Last year Golden Minerals merged with ECU Silver on a 20 to 1 basis, or one share of GM for 20 ECU shares. During the debacle of the last few months of the year, GM was taken down to $5.23, which was the equivalent of 26 cents ECU, a total disaster for any of us who invested in them a decade+ ago at the same price or more. During the downturn over the past couple of years, there were a couple of visible short sellers trashing ECU publicly and making a big deal what a short it was. For whatever the reason they've won out thus far. That’s the way it has been. However, during the month of January GM has stormed back, still rinky-dink in terms of ECU of old, but still quite an impressive performance, rising all the way to $9.55 this morning. Technically it achieved a major breakout. When, out of nowhere it began to collapse today with the HUI up 10, gold flying, and silver sharply higher. It was clobbered down to $8.78, down 57 cents on the day. We contacted the company to find out if there was any news out, or was there any announcement of insider selling? The answer was no. What I did learn was that as of January 13 there were still 2,343,799 shorts still on the books. That is the official number. Our guess is that the real number is double that. Today’s action suggests the shorts are not throwing in the towel yet, even with the dramatic inflation announcement by the Fed which ought to send gold and silver shares soaring in the months ahead. It is my bet that these bums have overstayed their welcome at the party and are going to get blown out over those months. It couldn’t happen to a creepier bunch of fellows. It is also my bet that GM is going to $90 per share when silver soars toward $100 per ounce.. That might sound like a stretch, but it is only a triple from GM’s old high … which is only a ten bagger from here, a move that will be commonplace in the years ahead when the gold/silver share mania kicks in. It is only a question of time before the shorts in GM, and in a number of other precious metals shares, cry "UNCLE." It is only a question at what price they surrender. As of 12:00 CST, AUMN has made a 180 degree turn and is unch at $9.35 on 300M shares. 1. An ignorant institution bailing the stock recklessly—he won’t be employed long! 2. A brokerage firm haphazardly liquidating a margin call of an institutional client. 3. A short protecting the already-existing 2.3 million share short position and preventing the stock from closing above a technical level of 9.40, as well as an effort to push it below the benchmark $9 level. Then, buying/covering the new shorts placed earlier once the stock began to recover from the $8.78 low. If this is the case, it has only required 50,000 shares to fully recover the loss and the short might be even further exposed. GM closed at $9.16, below its breakout point. "viens d'acheter plus d'actions à 4.87 $ , prix que j'avais payé pour écu, il y a 11 ans .le trend baissier d'un an est cassé à la hausse. Très sousévaluée "
Just bought more Golden Minerals at $4.87, which is what I paid for the prior ECU 11 years ago. Stock broke year downtrend. SO undervalued. les shorts qui étaient en train de couvrir en panique seront ravis de l'aubaine ! GOLDEN, Colo., Sept. 14, 2012 /CNW/ - Golden Minerals Company (NYSE MKT: AUMN) (AUM.TO) ("Golden Minerals" or the Company") is pleased to announce that it has entered into an underwriting agreement with Wells Fargo Securities to sell 5,497,504 units, comprised of one share of common stock and a five year warrant to acquire one half of a share of common stock at an exercise price of US$8.42, at a price of US$5.75 per unit, for gross proceeds of US$ 31.6 million. Net proceeds, after underwriting discounts and estimated offering costs, will be approximately US$29.5 million. In its most recent production update, AUMN mentioned that with about $20M of funding, it will be able to expand production to 2M oz. of silver by 2Q 2013, and then with extra $50M, further expand to 4M oz. by the end of 2014. At that volume, its cash cost per oz. will be less than $7, so at $37 silver (I think silver is going to be MUCH higher by the end of 2014, since U.S. employment is not going to improve markedly and the Fed will keep buying the MBS securities for a long time), AUMN will be making $30 of cash profit on each oz., for a total cashflow of $120M per year. Its current market cap is only $210M, so its market cap would have to rise A LOT by the end of 2014 (it will rise steadily as AUMN keeps increasing its production). Merci à Jean pour l'info... qui m'avait échappée ! Dans sa mise à jour la plus récente production, AUMN mentionné que, avec environ 20 millions de dollars de financement, il sera en mesure d'accroître sa production pour 2M oz de l'argent par 2Q 2013, puis à 50 millions de dollars supplémentaires, d'étendre à oz 4M. d'ici la fin de l'année 2014. GOLDEN, Colo., Oct. 11, 2012 /CNW/ - Golden Minerals Company (NYSE MKT: AUMN); (AUM.TO) ("Golden Minerals" or "the Company") today provided production results from the Velardena Operations for the quarter ending September 30, 2012 . Payable production for the third quarter was approximately 120,000 ounces of silver and 1,900 ounces of gold, 28% higher for silver and 27% for gold, as compared to the second quarter, and 18% and 19% higher for silver and gold, respectively, as compared to the average quarterly payable production for the first half of 2012. For the first three quarters payable production was approximately 325,000 ounces of silver and 5,100 ounces of gold. Additionally, Velardena produced approximately 290,000 pounds of payable lead and 320,000 pounds of payable zinc in the third quarter and 700,000 pounds of lead and 930,000 pounds of zinc for the the first three quarters of 2012. Jeffrey Clevenger , President and Chief Executive Officer, commented, "Our target for operationally positive cash flow beginning next year is on track with all of the equipment on site to achieve our mining ramp-up goals. Third quarter production is indicative of the progress being made by the team at Velardena." Mine development and ramp-up to the 850 tonne per day combined oxide and sulfide plant throughput is proceeding as planned, with a steady state run-rate of 850 tonnes per day anticipated in the third quarter of 2013. Engineering studies are also underway for the phased expansion to 1,150 ore tonnes per day. Golden Minerals Company is a Delaware corporation based in Golden, Colorado, primarily engaged in silver and gold mining at its Velardena Operations in Mexico and advancement of the evaluation stage El Quevar project in Argentina . This press release contains forward-looking statements within the meaning of Section 27A of the Securities Act and Section 21E of the Exchange Act, and applicable Canadian securities laws, including statements regarding of the timing of anticipated mine development and production ramp-up at the Velardena Operations and the achievement of operational positive cash flow, the sufficiency of mobile mining and other equipment on site for mine development and production ramp-up activities, and the planned expansion of Velardena Operations production; and the requirement for external funding for an expansion. These statements are subject to risks and uncertainties, including unexpected events at the Velardena Operations, including further delays or problems in mine development and plant optimization; operational changes or problems; variations in ore grade and relative amounts, grades and metallurgical characteristics of oxide and sulfide ores; delays or failure in receiving required board or government approvals or permits; technical, permitting, mining, metallurgical or processing issues; failure to achieve anticipated production and improvements in head grades, recoveries and concentrate production and quality at the Velardena Operations; delays in or failure to realize anticipated benefits of plant optimization efforts; need for and timing and availability of external funding on acceptable terms to construct expanded production facilities; unfavorable interpretations and changes in interpretation of geologic information; failure to realize anticipated gold production increases from the addition of the bulk flotation process being installed at the oxide plant; failure to realize anticipated production increases from the anticipated increase in mine development; loss of and inability to adequately replace skilled mining and management personnel; disputes with customers or joint venture partners; failure of undeveloped ore or veins to meet expectations; volatility or other changes in the U.S. and Canadian securities markets; availability and cost of materials, supplies and electrical power required for mining operations and exploration; fluctuations in silver, gold, zinc and lead prices, costs and general economic conditions; changes in political conditions, tax, environmental and other laws; and diminution of physical safety of employees in Mexico and other conditions in the countries in which the Company operates. Additional risks relating to Golden Minerals Company may be found in the periodic and current reports filed with the Securities Exchange Commission by Golden Minerals Company, including the Annual Report on Form 10-K for the year ended December 31, 2011 . GOLDEN, Colo., Nov. 8, 2012 /PRNewswire/ -- Golden Minerals Company ("Golden Minerals" or the "Company") (NYSE MKT: AUMN) (TSX: AUM) announces results for the quarter ending September 30, 2012 and $2.0 million in fourth quarter exploration property sales. For the third quarter 2012, Golden Minerals recorded a 45 percent increase in revenue to $7.1 million from the sale of metals at its Velardena Operations in Mexico, as compared to revenue of $4.9 million in the second quarter 2012. Also during the third quarter, the Company recorded a $57.2 million non-cash reduction in goodwill related to its September 2011 transaction with ECU Silver Mining Inc. The goodwill was initially established primarily as a result of recognizing, for accounting purposes, a deferred tax liability for the difference between the fair value of the Velardena property acquired in the ECU transaction and the Mexican tax basis of the property. Since September 2011, an approximate 20% decrease in forecasted future gold and silver prices and certain changes to assumptions related to the long term operating plan for the Velardena Operations has resulted in the reduction of goodwill. There was no reduction in the carrying value of the long-lived Velardena property. The Company's cash and short term investments balance increased by $30.9 million during the quarter to $54.0 million as of September 30, 2012. The increase is due to $36.9 million in net proceeds received from a registered offering and private placement of our securities during the quarter, offset by the expenditures described above plus capital expenditures of $2.0 million and an increase in net working capital of $2.2 million, both related primarily to the Velardena Operations. GOLDEN, Colo., Nov. 28, 2012 /PRNewswire/ -- Golden Minerals Company (NYSE MKT: AUMN; TSX: AUM)("Golden Minerals" or "the Company") today announced that Jerry W. Danni, Executive Vice President of Golden Minerals Company, has resigned from his position effective November 30, 2012 to pursue another career opportunity. mmouais , c'est jamais bon signe ça !!! pour info un certain silverbull50 poste ceci sur agoracom, aucune id de qui est ce gars là ! et "tout ça ne change rien etc etc etc "
1. He is taking a position with Goldcorp in the Environmental area, which has been his forte throughout his career. The announcement was just approved this morning and will be announced shortly by GG. 2. He stressed that the resource at Valardena is everything AUMN anticipated with "bottomless" mineral and excellent grades. 3. They are currently producing near 1 million silver-eq. ounces at 500 tpd. At 850 tpd in Q3 '13 they will be producing near 2 million silver-eq. ounces annually. At 1150 tpd (Q4 '14) they still project 3.5- 4.0 million silver-eq ounces. At merely $30/oz. silver, that provides $105-120 million cash flow annually. Excluding cash, that is a 1:1 cash flow--market cap ratio. AEM and GG trade at 10-15 X cash flow as a comparison. 4. Overhead costs will decline with his departure. 5. Q4 '12 production progressing as expected. 6. He remains a large shareholder and will retain his residence in Golden, Co. and commute to Vancouver (GG) for the next two years. 7. IMO, there appears to be zero skeletons related to Danni's departure. 8. Karen Winkler will remain IR and Bob Vogel--CFO will inherit some of Danni's responsibilities. achats d'investisseurs institutionnels qui sont en train de prendre à revers les shorts, on dirait ! 1. 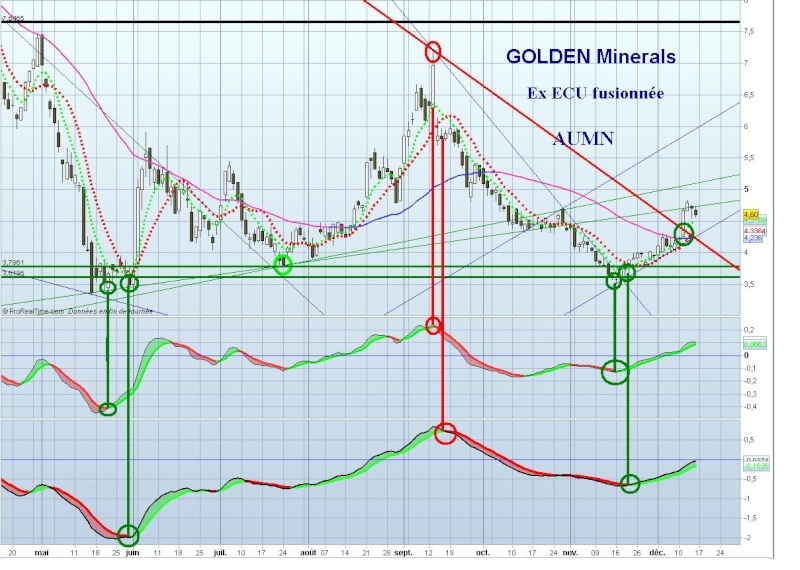 Golden Minerals Company (AUMN, Earnings, Analysts, Financials): Engages in the exploration and development of precious metals and other mineral properties in Mexico and South America. Market cap at $171.17M, most recent closing price at $4.02. Net institutional purchases in the current quarter at 2.1M shares, which represents about 6.26% of the company’s float of 33.56M shares. Over the last six months, insiders were net buyers of 1,365,790 shares, which represents about 4.07% of the company’s 33.56M share float. GOLDEN, Colo., Jan. 17, 2013 /CNW/ - Golden Minerals Company (NYSE MKT: AUMN; TSX: AUM) ("Golden Minerals" or "the Company") provides production results from the Velardena Operations for the fourth quarter 2012. Payable production during the fourth quarter 2012 totaled a record of approximately 134,000 ounces of silver, an increase of about 13 percent over third quarter 2012 production and 72 percent greater than the fourth quarter 2011. Payable gold production during the fourth quarter 2012 was 1,300 ounces, about 33 percent less than the third quarter 2012 production and an increase of about eight percent above the fourth quarter 2011. Full year 2012 payable production totaled approximately 457,000 ounces of silver and 6,500 ounces of gold for a total of about 782,000 silver equivalent ounces for silver and gold only (equivalents calculated at 50:1). Additionally, the Company produced approximately 330,000 pounds of payable lead and 480,000 pounds of payable zinc during the fourth quarter, bringing full year 2012 production to approximately 1.0 million pounds of lead and 1.4 million pounds of zinc. Record silver production for the fourth quarter was achieved primarily due to efforts to reduce dilution to the ore feeding the mills, with a 45% increase in grade for the fourth quarter as compared to the first quarter. Gold production during the fourth quarter 2012 was negatively impacted by lower gold recovery at the Company's processing plants primarily due to the occurrence of different mineralogy in some of the newly developed ore areas and to a lesser extent by reduced tonnes mined during the fourth quarter due primarily to shortages of miners as previously reported. The Company is currently working to improve gold recoveries for the recently encountered ore, including testing different reagents and grinds in the sulfide plant, and conducting various tests to determine the ores or blend of ores that yield the best results in each plant. The Company is working with its unions to improve miner availability and have recovered about half of the shortfall. The Company currently expects throughput rates at Velardena ranging from approximately 500 to 600 tonnes per day in 2013, ramping up late in the year with achievement of an 850 tonne per day production rate in late 2013 or early 2014. The Company is focused on improving gold recoveries, continued optimization of the plants and mine plan, and completion of the San Mateo ramp, which is expected in the fourth quarter 2013 as previously reported. The San Mateo ramp, which will permit trucking of ore from the productive Santa Juana mining unit to the concentrating facilities on the surface, should increase the amount of daily production from Santa Juana, as ore currently must be hoisted through an internal shaft with limited capacity. Prior to completion of the ramp, the Company had planned to augment material from Santa Juana with vein material from other mining areas to achieve a daily production rate of 850 tonnes per day in the third quarter 2013. However, recent mining in two of the other mining areas has encountered narrower veins than anticipated, making the earlier ramp-up less attractive. Bref, le plus étonnant c'est que la news que je m'apprêtais à poster ait disparu pile poil au moment ou je réinitialisais mon PC après plantage. After a rough 2012, these shares have been trending higher in the first weeks of 2013, but there was a recent pullback after the company announced fourth quarter production. Production for the fourth quarter 2012 totaled a record of approximately 134,000 ounces of silver, an increase of about 13% over third quarter 2012 production and 72% greater than the fourth quarter 2011. However, gold production during the fourth quarter 2012 was about 1,300 ounces, which is about 33% less than the third quarter 2012 production and an increase of about 8% above the fourth quarter 2011. The gold production in Q4 is seen as a short-term negative which was due to various factors including a shortage of miners. However, the company is focused on increasing gold production in 2013. That is why this could be just a short-term opportunity to buy the shares in a pullback, before the recent uptrend resumes. Salta, Argentina and to reduce El Quevar holding costs. to Golden's acquisition of the property in September 2011 .
operations are consistent with these expectations. concentrators could be installed later in 2013.
and evaluation of expansion options later in the year. the end of 2013 of approximately $24 million . Annual Report on Form 10-K for the year ended December 31, 2011 .
résultats 2012, pas folichon : les shorts ne l'ont pas loupé, notamment aujourd'hui ! $57.2 million of which was recorded previously in the third quarter. sale of the Platosa net smelter royalty. avec un peu de retard , puisque la news date du 11 avril dernier, mais c'est pratiquement la seule minière à terminer largement verte ce vendredi. GOLDEN, Colo., April 11, 2013 /PRNewswire/ -- Golden Minerals Company (NYSE MKT: AUMN; TSX: AUM) ("Golden Minerals" or "the Company") announces preliminary production results from the Velardena Operations for the first quarter 2013. Payable production during the first quarter 2013 totaled approximately 215,000 silver equivalent ounces (equivalents calculated at 50:1, gold: silver) and included 150,000 ounces of silver and 1,300 ounces of gold. Total payable production increased 9 percent compared to the fourth quarter 2012. These amounts are in line with the Company's 2013 operating plan. Payable silver production during the first quarter 2013 reached a record high of approximately 150,000 ounces, 12 percent greater than the fourth quarter 2012. Payable gold production during the first quarter 2013 totaled approximately 1,300 ounces, 2 percent greater than the fourth quarter 2012. Payable production figures include only silver and gold. The Company also produced approximately 320,000 pounds of payable lead and 460,000 pounds of payable zinc during the first quarter 2013, also in line with the Company's 2013 operating plan. On March 8, 2013, Mexican regulatory authorities suspended the Company's explosives permit for the principal producing areas of the Velardena Operations due to the proximity of the blasting cap magazine to the occupied mine facilities, a situation that had existed for more than a decade. The Company immediately relocated the employees to other mine buildings and regulatory authorities agreed on March 9 that the Company's remediation plan was acceptable, pending the regulatory authority's compliance with its formal procedures to reinstate the permit. The permit was reinstated on April 10, 2013 and the Velardena Operations are currently in the process of rebuilding broken rock inventory. During the permit suspension, the Company used the opportunity to complete additional flow capacity in the oxide leach circuit and add cleaner flotation capacity to the float circuit ahead of the oxide circuit. These projects are anticipated to improve both silver and gold recoveries. The Company's 2013 operating plan calls for an increase in quarterly production throughout the year. Production in the first quarter was not significantly affected by the explosives permit suspension due to the availability of stockpiled broken ore, but due to the depletion of broken ore in the mine and the duration of the suspension, the Company expects second quarter production to be lower than the first quarter. The Company continues to expect that the San Mateo ramp will be completed during the third quarter 2013, and that production in the third and fourth quarters will exceed first quarter production as broken material inventories are replenished in the mine and additional development work opens new stopes for production. The Company currently expects to produce between 900,000 and one million ounces of payable silver equivalent in 2013 due to the explosive permit suspension.